For more than 50 years, the Galleries of Loyd-Paxton have offered extraordinary furnishings and artworks from around the world. 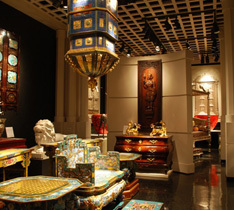 A visit to their black-walled gallery is akin to a personal visit to fabulous and forbidden French and Asian palaces. The highly vetted pieces are in pristine condition, perfect for discerning patrons who value living with priceless antique furniture and objets d’art.